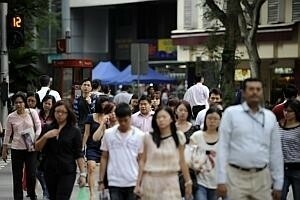 While Singaporeans may be getting more upbeat about their job prospects and personal finances, consumer confidence levels here still fall on the side of pessimism, a survey has found. According to Nielsen's Global Survey of Consumer Confidence and Spending Intentions released yesterday, confidence levels in Singapore slipped in Q4 last year and remained flat for three consecutive quarters. But confidence bounced back in Q3 this year to the same level a year earlier. "The higher-than-expected GDP growth that Singapore experienced in Q2 has had a positive impact on consumers' confidence, which has increased this quarter for the first time in 12 months," said Luca Griseri, head of financial services, Nielsen Singapore and Malaysia. However, the Republic's exact reading on Nielsen's Consumer Confidence Index showed that Singaporeans aren't that sanguine after all. Despite rising to 98 points in Q3 2013 - after three straight quarters of 95-point readings - Singapore's score was still shy of the 100-point baseline. By Nielsen's measure, consumer confidence levels above and below a baseline of 100 indicate respective degrees of optimism and pessimism. Its survey measures consumer confidence, major concerns and spending intentions among more than 30,000 respondents with Internet access in 60 countries. Some 502 respondents from Singapore were polled between Aug 14 and Sept 6. Consumer confidence increased in 34 out of the 60 markets measured, and the global average stood at 94 points. Despite declining four index points, Indonesia (120 points) reported the highest consumer confidence index worldwide for the third consecutive quarter. Singapore came in 11th. Sixty one per cent of Singaporeans rated their job prospects in the coming year as good or excellent, up nine percentage points from the last quarter. There was an improvement in consumers' outlook with regard to their personal finances, with 54 per cent of Singaporeans viewing the state of their personal finances in the next 12 months as good or excellent, up four percentage points from Q2 2013. Singaporeans' plans to save for the future saw an uptick in the last quarter, with 64 per cent of all respondents putting spare cash into savings and 30 per cent investing in shares of stocks and mutual funds, a quarterly increase of four and six percentage points, respectively. Meanwhile, investment sentiment increased in 57 per cent of all markets measured across the globe compared to Q2. Consumers in South-east Asia continue to rank among the world's biggest savers, and channelling excess funds into savings was the number-one priority cited by consumers in the region after covering essential living expenses.